We’re getting ready for fishing season to open here in Patagonia, and since we’ve got ants in our pants we took advantage of nice spring weather to practice our fly casting technique. In the Province of Cordoba, the Secretary of the Environment initiated a plan in December of 2008 for restoration of the golden dorado (Salminus brasiliensis) in the Tercero River; responding to the near extinction of this species in this water system. 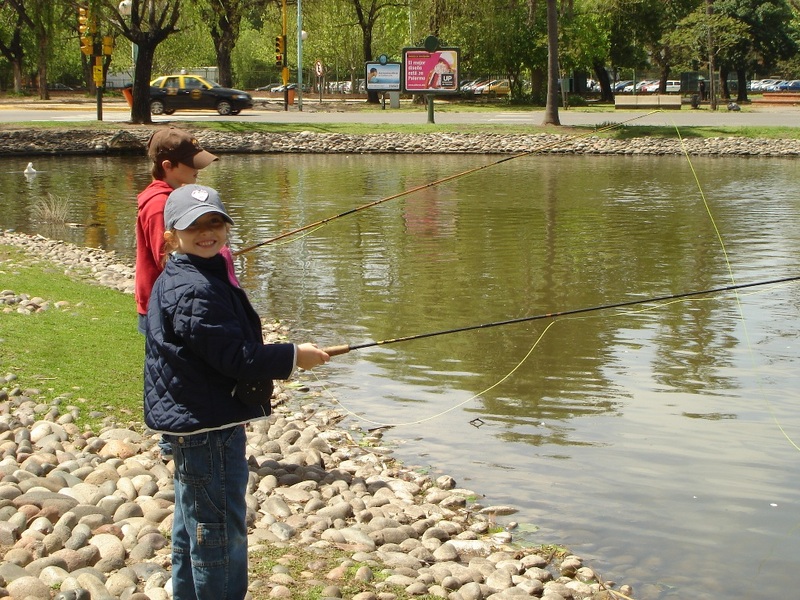 Due to it’s connection with the Parana River, 96% of the fish life in the Tercero originates in the Parana. The Dorado is a very important ecologic and economic species at both national and international levels. Today in the majority of the environments which the Dorado inhabits, the human impact has significantly diminished its population and in many cases caused the disappearance of this and other associated species. In the medium and long term, and with intelligent management of future populations of this species, it is possible to advance a Sustainable Use Program that permits the development of small economies at the local and regional levels. An example of this would be through the promotion of tourism such as fly fishing, and catch and release policies. The restoration of the dorado (S. brasiliensis) populations in the Tercero Rio water system it being done through a series of phases that have been deemed “participative”, since various social, government and non government sectors may be able to join work teams, that are being developed, as observers or active participants. Kudos to the Environmental Secretary and the Province of Cordoba. If you’d like to practice your Spanish and read more about this and other programs in Cordoba, you can click on the image at the top of this post and visit their website. The Sea Breeze News ^ | September 3, 2009 | Steve Hoyland Sr.
Two weeks ago a group of four men, Steve Hoyland Jr. with friends Bruce, Ken and Erik, set off on an overnight offshore fishing trip. They left at noon on a Tuesday and went about 120 miles out into the Gulf. They were having a great night of fishing, catching big snapper, grouper, ling and kings. About 3 am, two of them went down below to catch some sleep. The two remaining on deck were catching fish and drinking beer, enjoying the warm tropical night air. All at once, Bruce got a big run on his line. This thing went all around the boat and took more than twenty minutes to bring up to the surface. When they got it up to the surface, they could not tell what it was. It looked prehistoric. Steve Jr. put a gaff in it and the two men dragged it aboard the 33 foot boat. As soon the big creature hit the deck, it went crazy, attacking them. 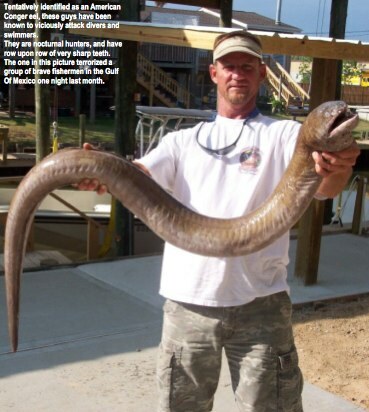 It was an eel over 6 feet long, weighing close to 100 pounds. It had a mouth full of sharp teeth and was extremely pissed off. The eel was later estimated to be sixty years old. Bruce said it came at him and Steve, Jr. like an anaconda, rearing it’s head up and striking at them like a rattlesnake. It was highly agitated and quite energetic. In the midst of thrashing around, the creature fell down below onto the floor between the two sleeping men, Erik and Ken. When they heard the thud and turned on the light, the eel raised it’s head right above Ken’s face. Erik rolled over and grabbed his 9 mm pistol. Steve Jr. started yelling. “Don’t shoot the gun in the boat! We’re 120 miles from land!” Next thing you know, all four fishermen were on the deck and the gigantic eel had sole possession of the bottom of the boat. Season the scallops of pike and steam them 4 minutes. To prepare the sauce heat the olive oil and roast the thin sliced tomatoes. Add the pine seeds and roast them lightly. After adding the white wine reduce it all. Before seasoning the sauce add the chopped parsley. Arrange the scallops on the plates and drape it with the sauce. Serve with side of braised strips of leek and vegetable pearls.